"Avogadro Corp is a tremendous book that every single person needs to read. In the vein of Daniel Suarez's Daemon and Freedom(TM), William's book shows that science fiction is becoming science fact. Avogadro Corp describes issues, in solid technical detail, that we are dealing with today that will impact us by 2015, if not sooner. Not enough people have read these books. It's a problem for them, but not for the emergent] machines." "Highly entertaining, gripping, thought inspiring book. Don't start without the time to finish - it won't let you go." "A fictional world where Portland is the hub for the most exciting advancements in technology... Jam packed with great references to deep Portland culture...and Portlandia-type references"
"Hertling builds a picture of how an AI could emerge, piece by piece, from technology available today. A fascinating, logical, and utterly believable scenario - I just hope nobody tries this at home." 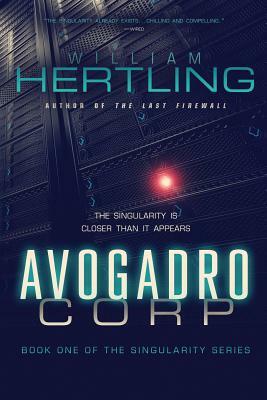 William Hertling is the author of Avogadro Corp: The Singularity Is Closer Than It Appears, A.I. Apocalypse, and the forthcoming The Last Firewall. A fifteen year veteran of the technology industry, he holds ten patents on software and internet technology, developed web and social media strategy at Hewlett-Packard, and is a frequent speaker at SXSW Interactive. He's been building online communities since 1986 when he ran seven phones lines into the back of his Apple //e to create an online chat system.